For better or worse, Pixel Qi tends to reside on the R&D side of life, rather than real-world application. But that's not deterring their innovation. You probably know Pixel Qi for their low-power, sunlight-readable displays, like on the Notion Ink Adam Tablet. But now they're looking into solar energy. Their next project will be to pair a 1W solar panel with their low-power display. With the tablet's larger form factor, they can transform the tablet's bezel into a large solar panel. 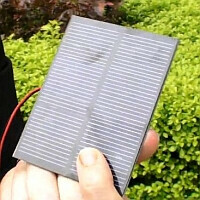 They explain that it would be like a calculator with a small row of solar cells, except on a larger scale. There are, of course, some practical concerns. While the 1W solar panel would be sufficient to power the Pixel Qi display, the rest of the tablet's functions are another matter. So unless they incorporate low-power components, it will still heavily depend on a battery. Pixel Qi explains that the solar panel would be an inexpensive addition to the tablet, so perhaps it will just serve as a supplementary power source. Another issue is the presence of direct sunlight. Any product manual will tell you to keep your device away from prolonged exposure to direct sunlight, so a solar panel might be somewhat of a mixed message. What do you think? Is this worth pursuing, or is it just a novelty? I think it's a good idea. Everybody wants an extended battery life for their devices.